Dissolve gelatin in water as directed on package. Add and stir in salt and vinegar. Chill gelatin, stirring often, until slightly thickened. Arrange a few radish slices in bottom of a 5-cup ring mold. Pour in a little of the gelatin to “anchor” the radishes. Chill until set. Fold in remaining radishes, cucumber and onions into remaining slightly thickened gelatin. Pour into mold. Chill until set. 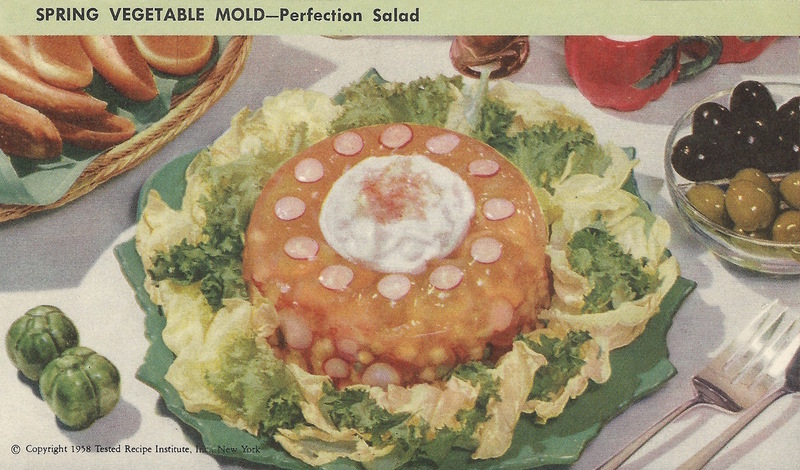 Unmold on a serving platter. Garnish with salad greens. Serve with mayonnaise, if desired. Makes 8 servings. Mix together gelatin, sugar and salt in a bowl. Add boiling water and stir until gelatin is throughly dissolved. Add lemon juice. Chill gelatin over a bowl of ice cubes and water, stirring occasionally, until gelatin is slightly thickened. Add and stir in cabbage, celery and pimiento. Turn mixture into a 1-quart mold. Chill in refrigerator until firm. Unmold on salad greens. Serve with mayonnaise or salad dressing, if desired. Makes 6 to 8 servings.